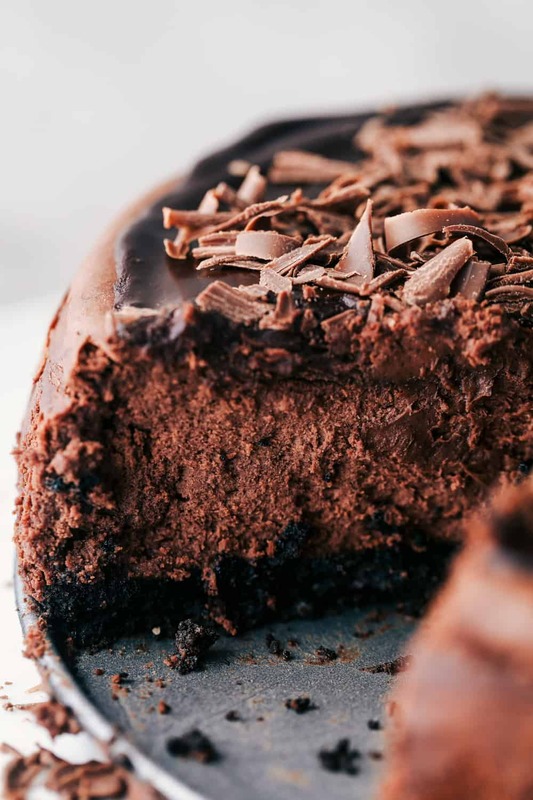 Death By Chocolate Cheesecake has an Oreo crust with creamy, decadent and rich chocolate cheesecake. 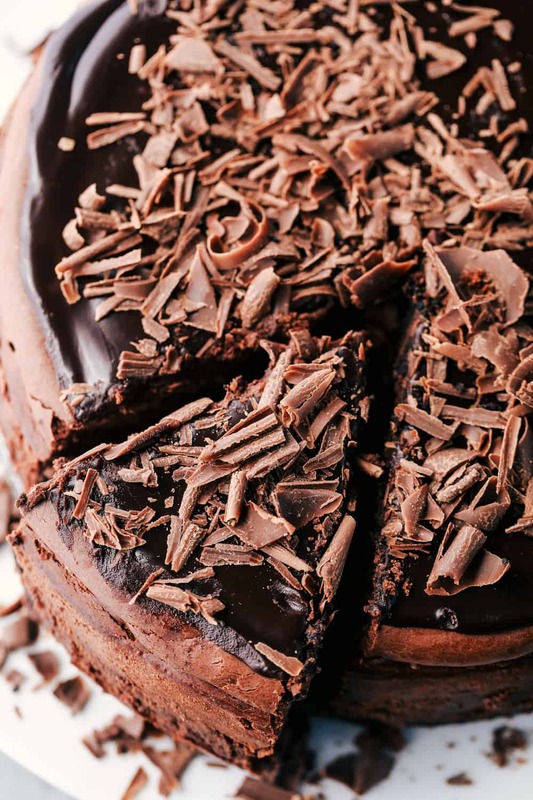 Topped with dark chocolate ganache this is a chocolate lovers dream come true! I don’t make desserts very often on the blog. But when I do, they are epic. My hubby is a mega chocolate lover and asked me to make this recipe about a year ago. I finally got around to making it for a family get together we had a few weeks ago. I am about a year behind with his requests, but this chocolate cheesecake recipe was so worth it! Since my hubby is a huge Oreo fan, it all starts with an Oreo crust. I am not a huge oreo fan but I LOVE oreo crusts. I am not a huge chocolate fan either so it was amazing that I loved this recipe so much. The chocolate cheesecake is so creamy, decent, and rich. It gets topped with a dark chocolate ganache layer and it made such a beautiful presentation at our family party! 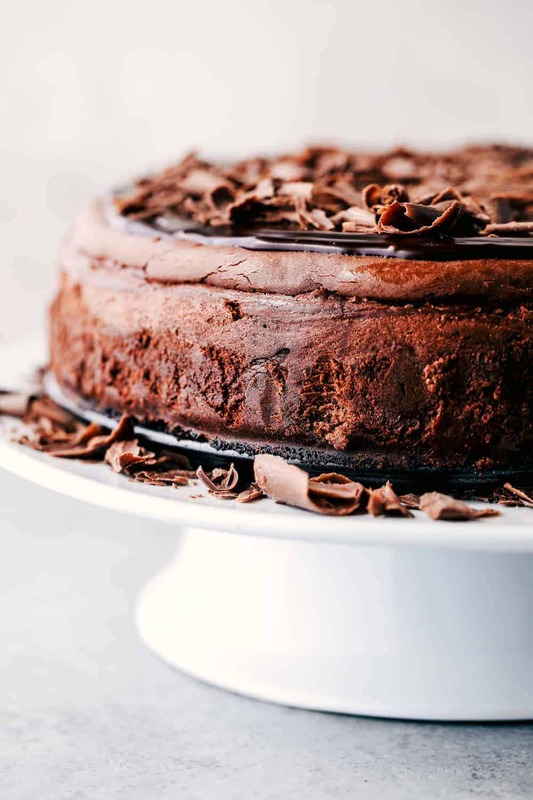 How do you make death by chocolate cheesecake? You start by making the oreo cookie crust. You pulse the oreos until they are fine crumbs and add the butter. Press into the bottom of a springform pan. Bake for 5 minutes and then allow to cool while preparing filling. To make the filling you melt 10 ounces of buttersweet chocolate. In a stand or hand mixer, beat together the cream cheese, sugar, and cocoa powder until smooth. Add in the eggs and melted chocolate. Pour over the oreo crust and bake. Top of your cheesecake with some dark chocolate ganache and chocolate curls and you are good to go! Do you have to make cheesecake in a springform pan? A springform pan allows for quick release and easy cutting. But you can also use any cake pan or pie plate. You can also use foil or parchment paper for easy realease. How do you store a cheesecake? Freshly baked cheesecake will keep for about 1 week in the fridge. Refrigerate covered loosely with aluminum foil or plastic wrap. Yes you can. Wrap cheesecake tightly with aluminum foil or plastic wrap or place in a heavy duty freezer bag. To make the oreo crust layer: Preheat oven to 350 degrees. In a food processor pulse the oreo cookies until they are fine crumbs. Put them into a small bowl and add the melted butter and stir until incorporated. Press into the bottom of your 8-9 inch greased springform pan. Bake for 5 minutes and remove and let cool while you make the filling. 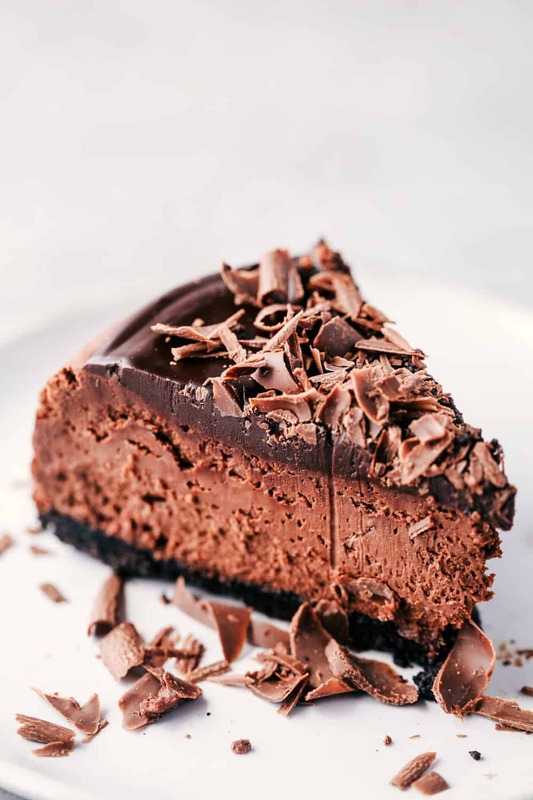 To make the cheesecake filling: Melt the 10 ounces of chocolate in the microwave or using a double broiler until smooth. Set aside. In a stand mixer or using a hand mixer, beat the cream cheese, sugar, and cocoa powder until smooth. Add in the melted chocolate and eggs and fold in until incorporated. Pour over the oreo crust. Bake for 1 hour or until the center is set. Let cool to room temperature. Release the spring form pan and cover with plastic wrap and refrigerate overnight. 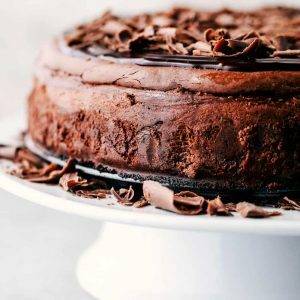 To make the chocolate ganache: Melt the chocolate, whipping cream and sugar in a small bowl in the microwave or in a small saucepan until smooth. Spread on the top of the cheesecake and chill until set. Top with chocolate curls if desired. The temperature is 350*. I am sorry that it was confusing for you to see. Omg Alyssa im dying to try this one.. As a chocholate fan I will put this recipe on my list, thank you so much.. This certainly is a chocolate lovers dream! YUM what a fantastic recipe. You pulse the oreos without the cream. I made this for the nurses I work with. I don’t care for sweet stuff so I didn’t even taste it but they were telling me it was awesome. I had a bunch of oreos left over so what I did was crunch most of them up into about half inch pieces or smaller and sprinkle them over the top of the cake right after I poured the ganache and let it chill in the freezer for a couple hours. Then I took the rest of the cookies, cut them in half and put a piece vertically so that each slice had half an oreo on top of it sticking out like I had wedged the whole cookie into it. It was really pretty and I got bonus points with my coworkers. I got a marriage proposal for the cake as well, it wasn’t sincere obviously but enough for me to go ahead and give 5 stars to the recipe. 8 oz. packages of cheese rather than 4. My end results came out very thick, much thicker than yours looked in the video. Making it for Christmas eve so hope I’m wrong. Hi!! I don’t bake or cook often, but when I do, it usually turns out really good. This however way surpassed my expectations!!! I just made it on a whim, but now I’m making it with purpose!! The only thing is, instead of 1 hour, mine has to go for another 30 to 40 minutes. I thought I was doing something wrong, but hey, as long as it’s this good, I’ll let it go however long it needs! I would like suggestions for alternative toppings though. Aside from fruits, too many people sensitive to too many different kinds of fruits. Thank you so very much for this recipe! Is this a dark chocolate flavor? If so any suggestions for creating more of a milk chocolate flavor? It is not dark chocolate but it is very much chocolate on top of chocolate. I would like to ask…. When you say 4 (8ounces) cream cheese, you mean 32 ounces? Thank you!! I made this minus the ganache. It was fantastic. It was gone in two days. My family are chocolate lovers like me. Thank you for this recipe.